The fate of the first manned mission to Mars was sealed with a six-sided die. 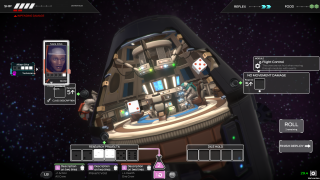 Tharsis is one of the most interesting games at PAX, an intersection of boardgames, FTL-style presentation, a mostly-realistic representation of space travel, and roguelike-like permadeath. And cannibalism, or at least the possibility of it. Responsible for a small crew, you have to direct astronauts to complete repairs and tasks across different modules of the spacecraft (each of which provide different bonuses), all while keeping them alive, fed, and sane. Tharsis plays out like a digital board game, with dice spent each round to fix stuff on the ship or complete research, and how you manage the risk of spending those dice (or re-rolling them to get a better result) determines the fate of your tiny astronauts, and which of Tharsis' different endings you'll arrive at.